When nighttime is coming, especially, during the winter days, you might feel like a nightmare is there; you may feel cold and you want to be warmer when staying on your couch or sofa watching TV or even reading your favorite book, instead, you need a tight sleeping more comfortable and warmer. So what you need to consider when those cold nights come, do you need to install a heating system or do you need something simpler and less costly? If you need to feel that warmth and coziness at affordable rates, saving your bills and not pay too much to install a new system! this simple quick guide is absolutely for you. What about considering Quilt blankets! Do you ever think about how much these quilt blankets are functional, soft, warm, cozy and also decorative to add over your bed or couch? Quilt blankets are the best to offer you warmth and coziness they have more layers in between to ensure that you will feel so warm and comfortable when wrapping yourself with one of these quilted blankets. 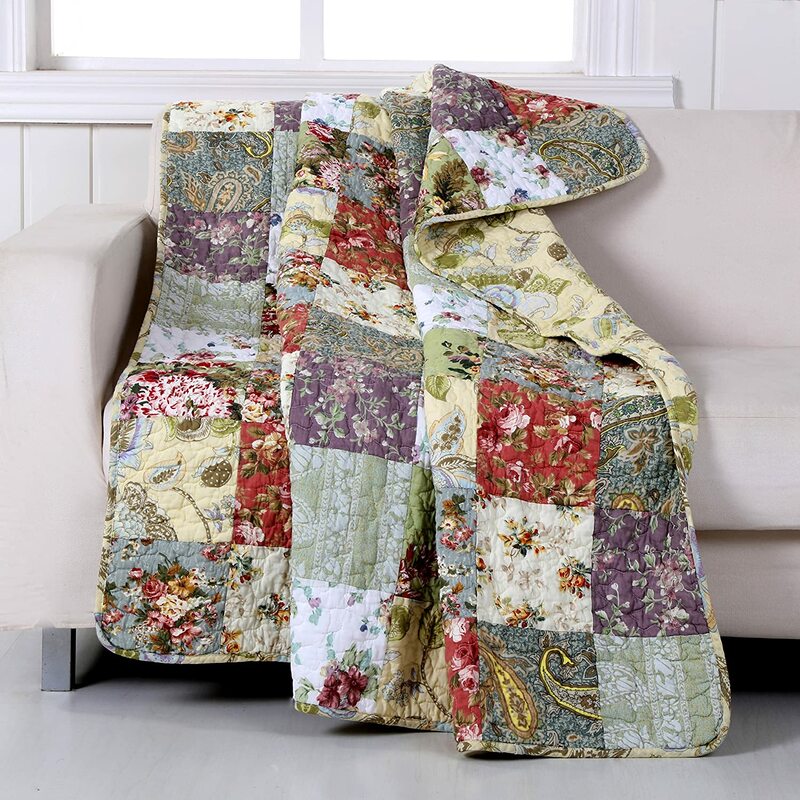 Moreover, these quilt blankets are not only for winter cold days, but you can also find some summer quilt blanket to get during hot days to chill out. 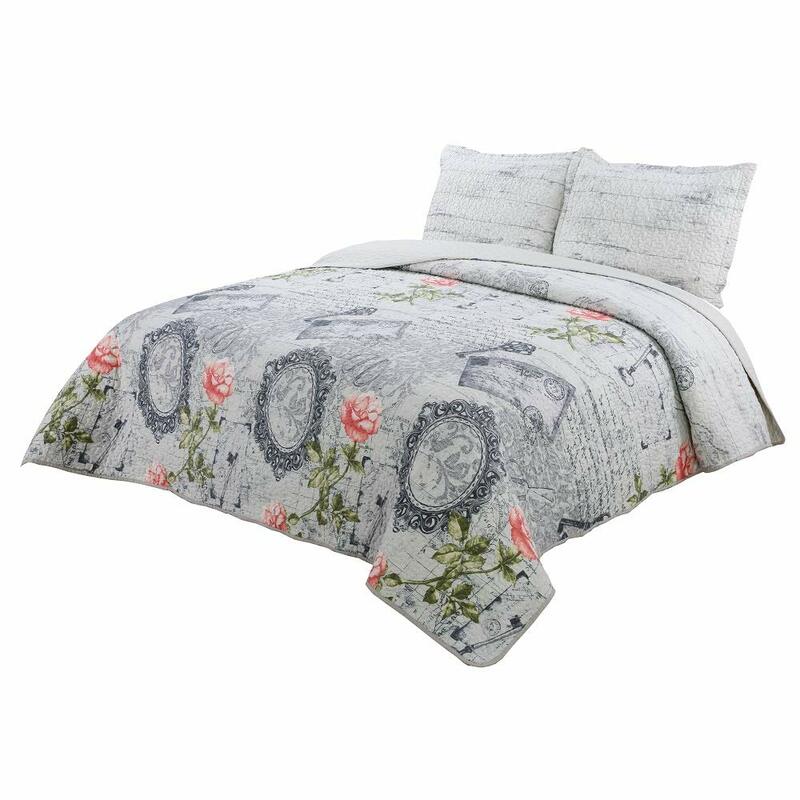 Whether you know that fact about quit blankets or not, it is advisable to keep reading that topic to know more about quilt blankets and what the best picks you can find out there when going for buying yours especially on Amazon on budget and within every taste as well. Woven Cotton Blanket designed by Utopia bedding is one of the best you can expect to find which is suitable to use all year around; in any season to feel cool in summer hot days or even to be warmer in the winter. 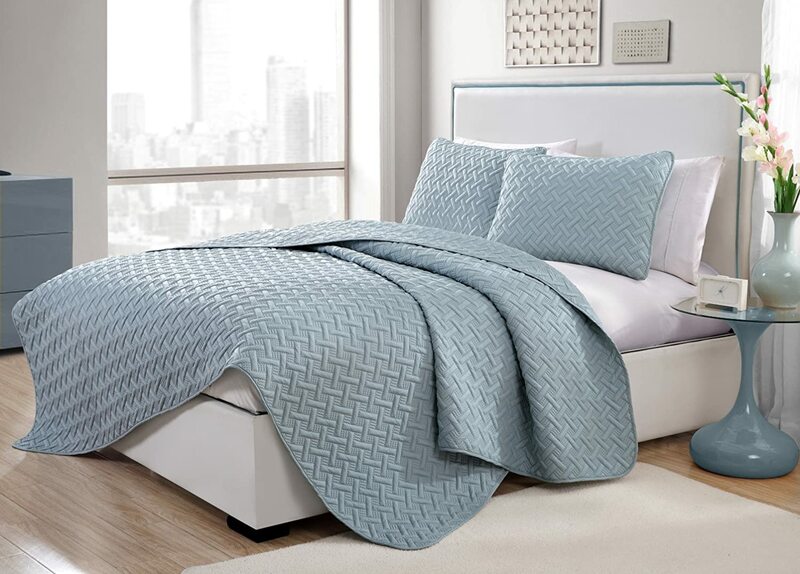 Utopia Cotton Blanket is designed by 100 pure cotton fabric with a dobby weave and waffle square patterns; this combination makes this quilted blanket more breathable and comfortable, warmer and softer. It is light in weight with a luxurious feel without any synthetic material addition and this woven tight fiber with its breathability nature ensures its availability to use during summer or winter nights. In addition, this means it is an ideal choice for your family to be safe and protected, moreover, for more safety and protection; it is an allergy-proof and protects you and your family from dust thanks to its hypo-allergenic properties. 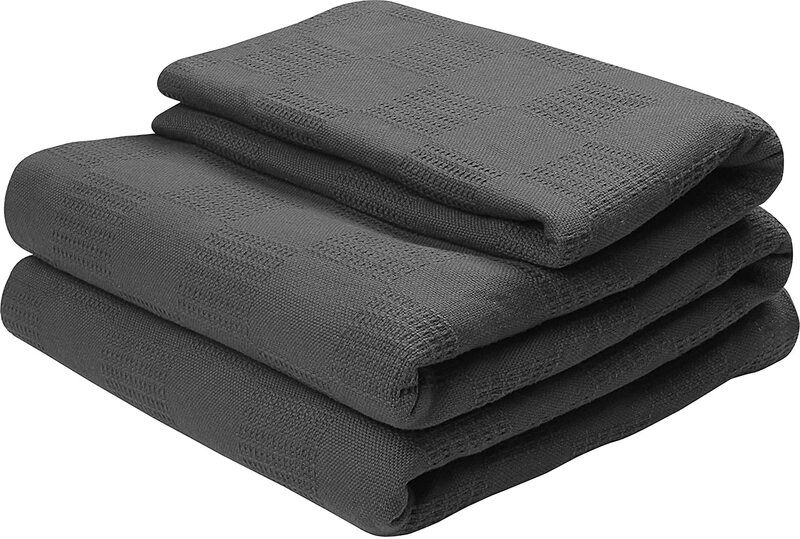 This Thermal cotton blanket from Utopia bedding comes in in twin, queen and king sizes but you will be surprised that this blanket size tends to be a bit oversized than normal due to the natural cotton shrinkage, available also in two neutral colors to suit every decor; pure white and smoke grey. It is a machine washable and you only need to hang it and let dry. Cotton Knit Quilt Throw Blanket designed by NTBAY is one of the best summer throws that you can ever have; it is an exclusive design from 100% cotton material, double-sided knitted, soft, warm and every member of your family from kids to elders will fall in love with it. In the days of summer, it is absolutely hot but sometimes there are some cool days are about to come or instead you feel a little bit cool due to your air conditioner so you need a summer blanket that keeps your shoulder, legs or the entire body be warm and cozy. This lightweight cotton with woven knitted sided is the best to offer you that; it is soft, quality, appealing and breathable as well. it is easy to care when you follow the manufacturer instructions; machine washable but with gentle cycle and cold water to keep it soft and adorable as it appears. 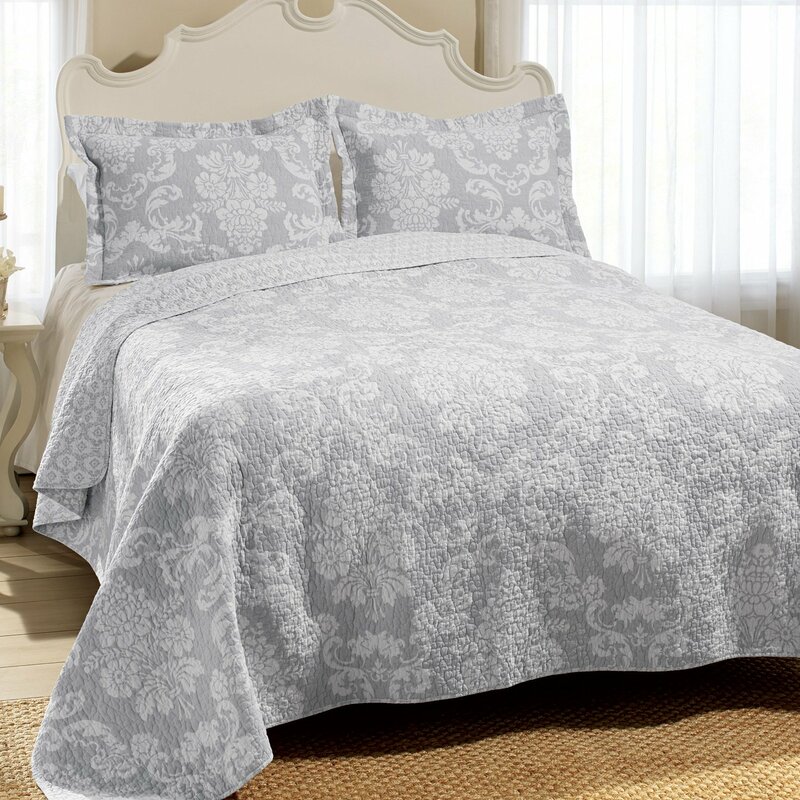 This Appealing Cotton Knit Quilt Throw Blanket designed by NTBAY comes in adorable catchy colors like white, navy, blue, orchid, a red and white combination and many more to satisfy every client taste and decor in addition to wonderful patterns to add such as floral, diamond, and rudder and so. 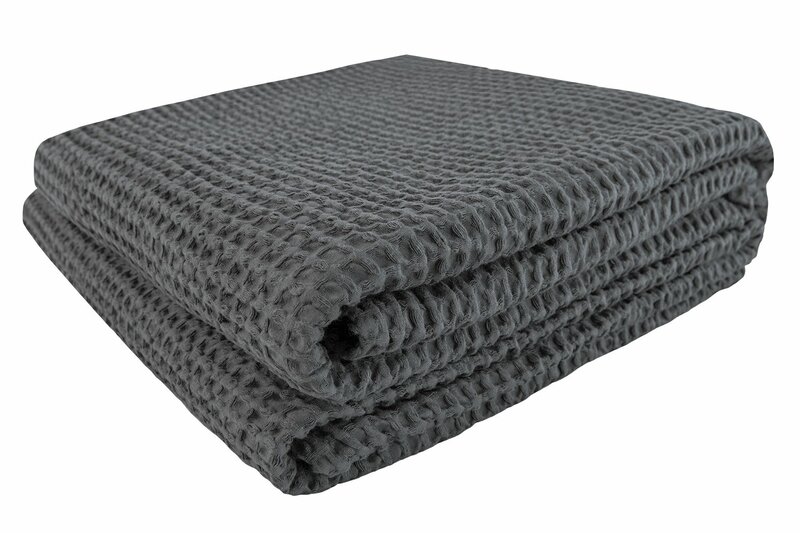 PHF Waffle Weave Blanket is another breathable pure cotton blanket to throw all over the year. This blanket has waffle patterns and 100% pure breathable cotton that make it ideal for every season and give you the warmth you need without sweating, the perfect addition for winter and summer as well. in addition, it is safe on your skin and has minimal environmental effect thanks to its Standard 100 by Oeko-Tex product label. it is also the perfect decorative touch you can add to your master bedroom, living area on couch or sofa to enjoy both functionality and charming appearance. it comes in more than 7 decorative yet fashionable colors including charcoal, green, khaki, white, orange and more. 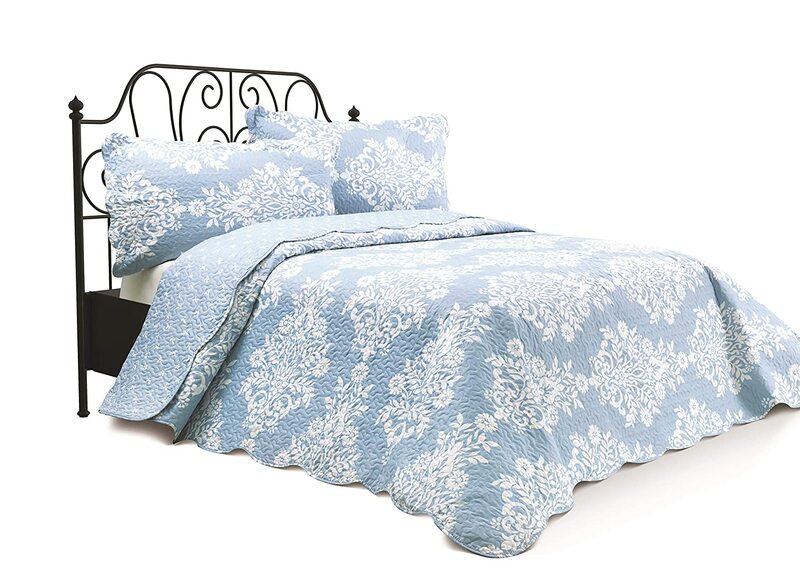 You can find it in 3 different sizes; a twin size 66″ x 90″, Queen size 90″ x 90″, and also King Size 108″ x 90″. In addition to these functionalities and decorative touch, this PHF waffle weave blanket in 100 % natural cotton is perfect to use when traveling or even for your toddler in a nursery; it is light in weight and soft as well. When it comes to cleaning and care; it is easy to care via washing machine with non-chlorine bleach if necessary, and tumble dry to keep its softness, smooth touch and coziness. 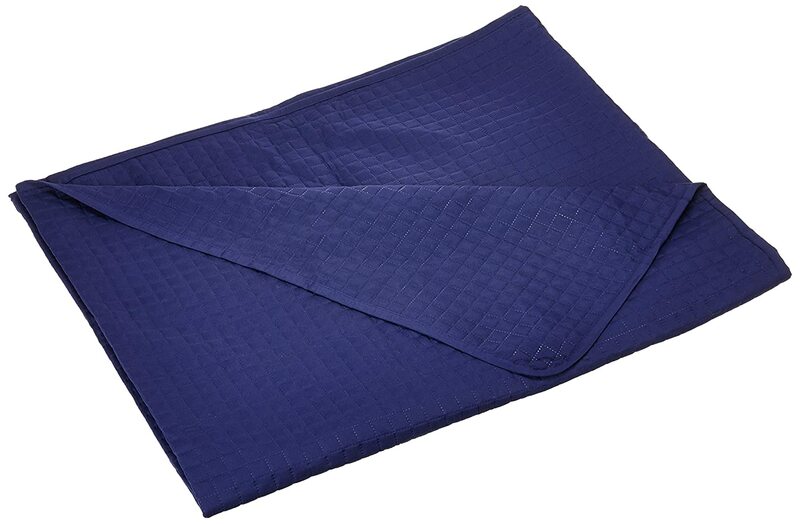 Exclusivo Mezcla Luxury Reversible 100% Cotton blanket is an ideal quilted throw for a cool summer evening or a cold winter day with another layer of cover to get the best warmth and coziness. This beautiful luxurious pick from Exclusivo Mezcla is what you seek when you need a premium product that combines between functionality and fashionable decoration with comfort; it is a reversible, cozy and decorative. 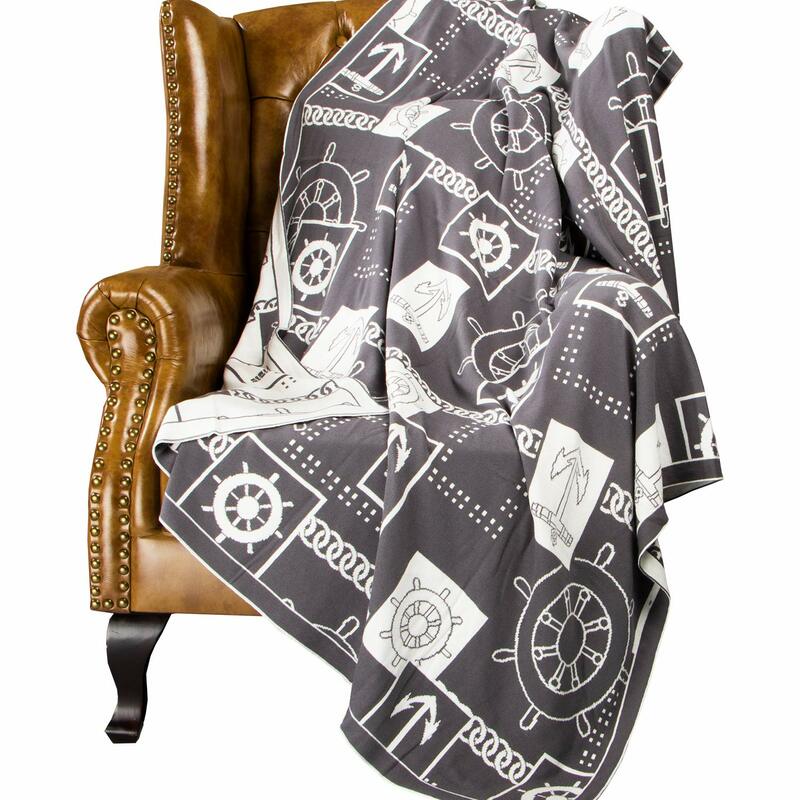 More specifically, it is a double sided throw blanket which could be used on both sides, it has a cotton fabric, a layer of cotton and polyester filling, and a woven back. 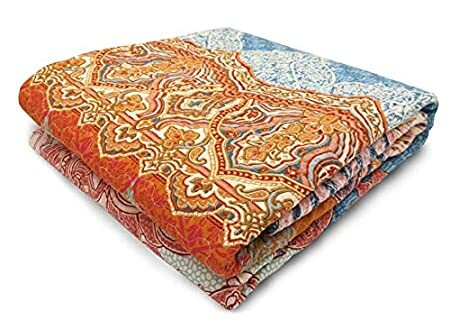 This combination of three gives this quilt cover means it’s durable, cozy and high-quality cover, in addition, it has a bohemian design which is completely decorative and classy to adorn any space at home. this vintage appearance with a multiple color decoration ensures that this throw will uniquely decorate your space and match every color scheme and styles. It is easy to clean and care with cold water, gentle cycle and no bleach, dryable with no iron use, in addition, after washing, we ensure you that the fabric anti-shrinkage, no color fading, and no unraveling. The price is really affordable and it is available in 4 bohemian patterns in 60″ x 50″ size. FineHome 3pcs Cover Set is a great pick to consider which offers quality, durability, and decorations along with comfort and softness. It is made of 100% polyester material facing and backing and 100% polyester filling but it is incredibly soft and cozy. 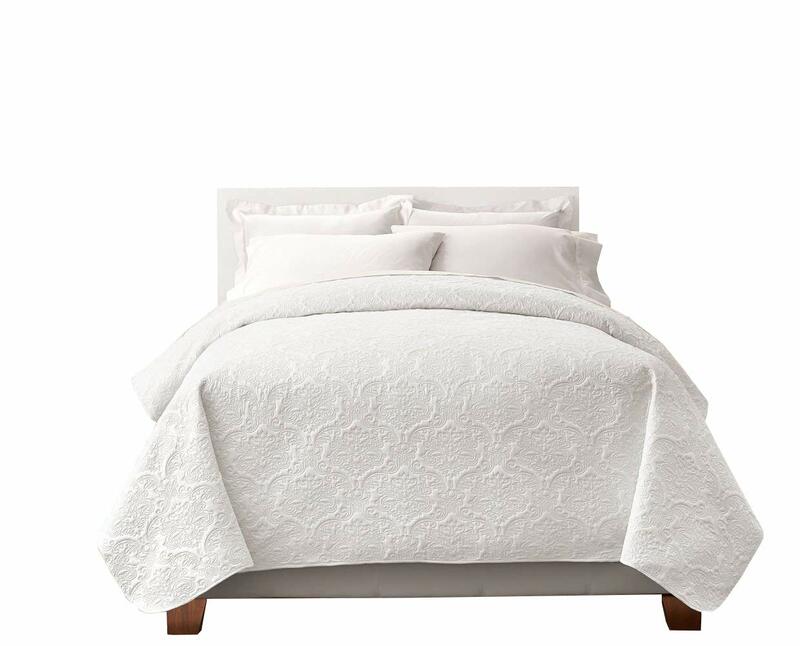 FineHome provides a fine quality brand new embroidery quilted bedspread in a set of 3 pieces; a quilt blanket and 2 matched pillows. This pick tends to turn your bedroom into a beautiful oasis with an extreme coziness; a homey and warm feeling you should cover yourself with and you can also provide your guest with that softness and beauty to show them your welcoming hospitality in the guest room. 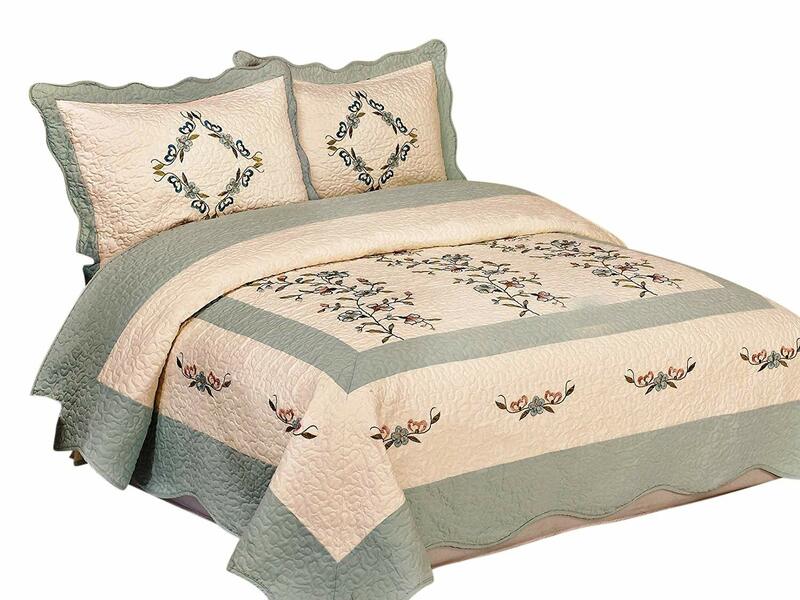 This embroidery quilted set comes in a variety of colors that satisfies various clients’ tastes and home decors. You can find them in embroidered beige with rose, sage-green, aqua-blue, burgundy, or taupe along with embroidered taupe with brown; what a charm you can add to your lovely space. 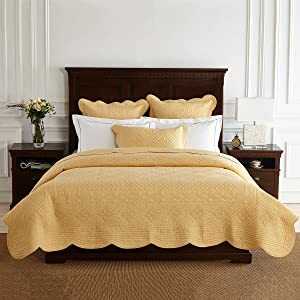 it comes in a queen/king size 102×94″ and two pillow sizes are about 20×30″, moreover, it is washable with cold water and gentle cycle and it comes with 30-day satisfaction guarantee but it has a top-rating with no complaint.